As expected, WeChat released an update today, one day after its third birthday. The same as the last update, the Android was out first and now only available on MyApp, Tencent’s Android app distribution platform. You have to download the MyApp app first in order to download the latest WeChat. And there’s only the Chinese version. English version will be released later with some different features. 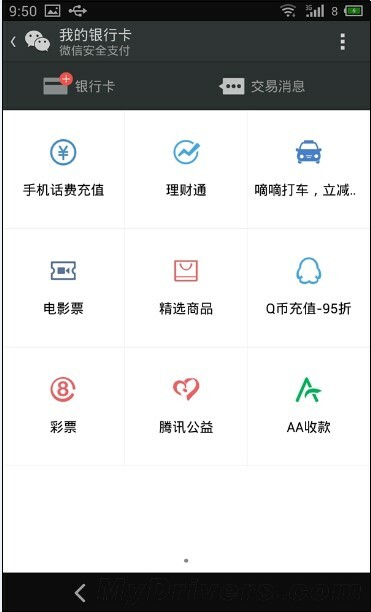 It now supports making payments for Didi (the taxi app venture backed by Tencent), Licaitong (the mutual fund, released several days ago, similar t to Alipay’s Yuebao), purchases on Tencent’s online retailer Yixun, QQ Coins (the virtual currency used in Tencent ecosystem), movie tickets, lottery tickets, making donations, phone bills and splitting bills. Converting voice messages into Chinese words with long click. Showing locations of conversation participants. Search for chat history or accounts. Notifications for mentions of user IDs in group chatting. Quick shares of photos to multiple WeChat friends. Emoticon recommendations when messages are being edited. A photo wall that has all photos of a conversation in one place. Update: The English version released later enables linking a LinkedIn account and showing it on user’s profile.